Summary: The creators of this system do a very poor job at providing us with anything of substance. I can't see how anyone would sign up with the lack of information being provided. It is unknown who the developers of the software are, but it’s quite clear that they are not getting the traction they want with only a handful of YouTube views despite being on the market for a few days already. To get in touch with support, traders can email [email protected]. For access to better systems, and real strategies go here. While I claim that we are unknown who the developers of the 1G Profit System are above, we are introduced to the founder in the members area, who goes by Adam Williams. The reason I didn’t change the review, is because there is really no information about Adam Williams anywhere on the Internet the type into the binary options market. It is also apparent that the image being utilized for Adam on the website is a stock image that has been purchased, thus it’s likely Adam does not exist, and is just a pen name. There is very little information about the software on the sales page. We are told that the system can be used on autopilot, that they have an exclusive VIP circle, a personalized news feed and 24 7 customer assistance. This is really all we are told, and the binary options trade logic is never elaborated on. In the frequently asked questions section we are told that the “average daily returns are estimated to be about $1300,” but with the clear lack of trading knowledge being presented on this webpage, I find this very difficult to believe. 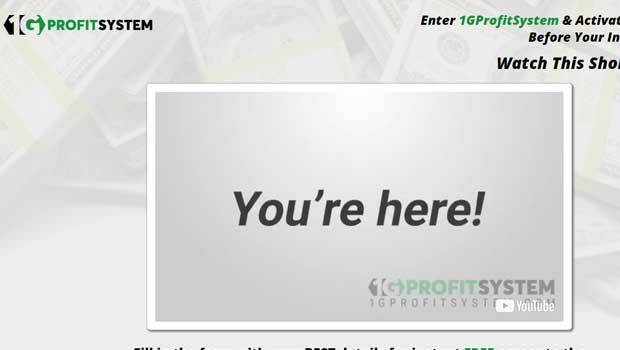 Sadly, like many other binary options systems, the 1G Profit System creators do a very poor job at explaining what sets them apart from their competitors. They tell us nothing, and hope that’s enough for us to believe that this is a viable investment. They need to do much more to convince me. Instead of actual trading results that show us exactly how the 1G Profit System performs, we are provided with 3 testimonial images. In each of these cases the traders are supposedly made in upwards of $100,000 from this trading software. There is even a little image that says verified right next to the avatars of the testimonials, but this is really just marketing trickery. None of these numbers are verified, and they provide no actual proof that shows us that any one of these traders is even a real human being. This type of marketing is just lazy. There is really nothing worthwhile to speak up when it comes to the 1G Profit System. It’s quite clear that the creators of the system aren’t ready to be releasing a trading software to the binary options marketplace. I recommend that the creators find a way to provide us with some actual trading results, and elaborate on their trade logic to prove to us that they are actually traders. If you have anything you want to add to this review, please leave your thoughts now.